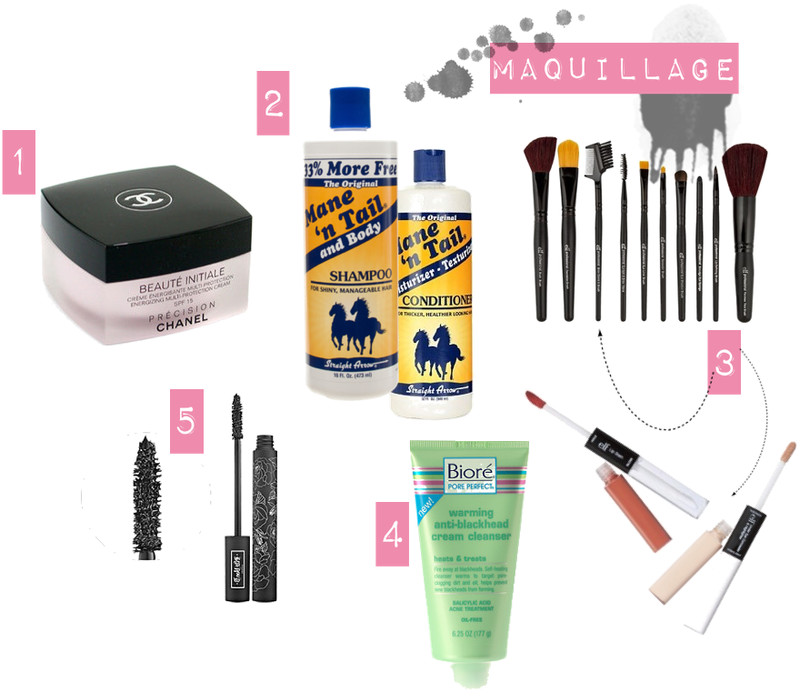 a few months ago i shared with you some of my tried and true favorite beauty products. by no means am i a beauty expert, which is primarily the reason why i share with you the beauty products i use on a daily basis. i'm all for good quality that is c-h-e-a-p. if i think a product is worth, i won't hesitate to buy it; but please, a little tube of gunk for $45? not for me. no thanks! 2.) Mane 'n Tail Shampoo/Conditioner, $7, each; I was a little skeptical to try this out because, well, it was originally made for horses. But i kept hearing good reviews and honestly, it was all true. The conditioner leaves my hair feeling so SO soft. 3.) E.L.F Makeup & Cosmetics; available online & at Target; I'll be honest here folks, i love this makeup line so much i kinda didn't want to share with you. i don't want them to jack up the prices!! seriously, it is SO cheap and honestly, for someone who really isn't doing anything glamorous on a daily basis this is perfect for me. I get the opportunity to experiment with new makeup without feeling guilty for throwing money away if i don't use it all. P.S. the concealer and bronzer/blush combo are my favorites. 4.) Biore Warming Anti-Blackhead Cleanser, $7.99; Biore is a company that i always go back to. i'm a huge fan of the cooling cleanser, and was pleasantly surprised to try this particular warming cleanser. it smells fresh, and oh baby, when you put it on your face - it.feels. so.good. don't say i didn't tell you so. 5.) Kat Von D High Frequency Mascara, $9; Again, i'll be honest, i only got this mascara because it was on sale at Sephora. i won't go out on a limb and say that i love this mascara, but i will say it's good. not the best, but pretty good. While those are my newest beauty products, these are ones that i must have in stock 100% of the time or else i'll freak out - no seriously, i need my aquaphor!! oh i've been wanting to experiment elf since it's so cheap but everyone says good things about it! I love Elf. It's so cheap but so good. I am a recent addict! Elf is a friendly prouctd .Thanks for such detials. i love lists like this!! i've always been so bad about taking care of my skin and having any kind of routine, thanks for the good picks and inspiration!! I splurge on moisturizer too - skincare in general. Lately I've been loving Shiseido products. i looove mane and tail.. i was convinced my sister was insane for using it at first.. it is pretty odd when you think about it.. but it's great. oh yes.